In the Gen 2 games (Silver, Gold, Crystal, HG, SS), you play through Johto and after you earned all 8 badges and beat the Elite Four, you then got to play through Kanto. I think it would have been cool if they did the same thing for all of the games, and if not all, then at least for the even numbered generations (Gen 4: Diamond, Pearl, Platinum/Gen 6: X & Y). For example, after you beat all of the 8 gym leaders and 4 elite four members in Sinnoh, you then get to go to Hoenn and do it there. And after you beat Kalos, you get to go to Unova. Or even after you beat Hoenn, you can go to Johto. 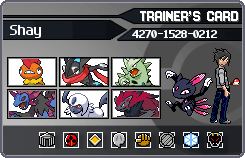 Or if you beat Unova, you can go to Sinnoh. etc. TL;DR: I think it would have been cool if they made it to where once you beat the game in one region, you then get to go play in the previous region (Like they did in Gen 2). they need to do an mmo that includes everything, getting an expansion pack whenever a new game comes out. The only reason they even went back to Kanto in Johto is this: during development, they couldn't even fit half of the original game into the cartridge, because by the time they passed the memory limit on the cart they were only halfway done with the cart. So they passed it to Satoru Iwata (current CEO of Nintendo) who managed to compress it enough that they could finish the rest of Johto and fit all of Kanto into the cart, and still have a lot of space. They currently fit so much stuff in the carts that I was impressed at how they even managed to get BW and especially its sequels into the DS carts. The other thing is, for both Gen 4 and Gen 6, they switched to a new game system, one that the developers just don't have time to get used to, so there really was no way they would expand the world to implement the previous game regions. They probably weren't even sure they could fit what they already have. Then, of course, there's the other problem that Johto was designed even in development to be the sister region to Kanto. Unova, Kalos, and Sinnoh were all designed to be reasonably far apart from the other regions. Making an MMO like that doesn't conceptually seem as hard as it actually is. There are so many factors preventing something like this from happening, least of which is that Nintendo doesn't have very good servers in the first place compared to their competition. (Although they are fantastic for the "price".) If they did somehow make an official Pokemon MMO, I can definitely see Wii U and/or 3DS sales going up, but the revenue probably wouldn't cover the expenses needed to run the darn thing. Wow I didn't know that, thanks for sharing that.